Does your home theater seem drab and outdated? Maybe your seating isn’t as comfortable as it used to be? Or, perhaps your sound system needs a little revamping. 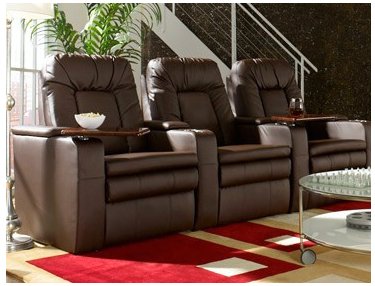 Home theater seating can be purchased at a variety of price points. Pricing is determined by brand, model, number of chairs, material, options (like power or manual recline), and accessories. Having a price in mind will help you stick to your budget and prevent you from making decisions you cannot afford. There are many options for all budgets. And, remember: you don’t have to upgrade your entire theater in one go. Picking up prized pieces over time allows you to refresh your theater without also breaking the bank. Financing options are often available as well. Trust us, the last thing you want is to purchase new home theater seats and not have them fit! Make sure to fully measure your environment that you will place your seats in. Pro tip: don’t forget about the distance to the back wall. Reclining your seat and putting up your feet is an important part of getting comfortable – be sure to allow enough room to do so without pushing the seat backs into the wall. If you have a tight seating space, our “wallhugger” seating allows users to fully recline while occupying a small amount of space. Next, consider your seat arrangement. Do you want single seating, loveseats, or a sofa? As the name suggests, single seating is for individuals and typically have the added bonus of armrests on either side. Loveseats contain a pair of seats with armrests on either end. These seats are perfect for couples (hence the name), but might be a bit too cozy for guests who don’t know each other well. Sofas, on the other hand, have three or more seats in a row. Like loveseats, they also have armrests on either side. You can pick sofas that are arranged in a straight line, but some come with a curved shape that allows all seats to have a better view of the screen. From these building blocks, there are many possible arrangements that you can try. Want four seats straight across? Or four seats, sofa-style? 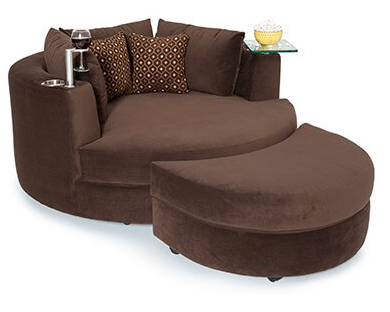 How about 2 single seats and a loveseat in the middle? Done! Arrangements can depend on the style of seating that you choose, but there are many final possibilities. Another pro tip: if you are planning on having more than one row of chairs, platforms and risers can give you the same tiered look that’s found in theaters, plus optimal viewing for all rows. Some styles even have a dedicated back row seat option so no risers are necessary! There are dozens of material options available for home theater seats. Leather is the most popular, and for a good reason too! Leather is durable, comfortable and beautiful. It also comes in a number of grades, from 3600 grade ultra-soft leather to 7000 high-grade leather. Theater seating also comes in a variety of colors, from traditional black or brown to bold shades of red or even yellow. Polyurethane or bonded leather are offered at lower price point, and they are also more resistant to scratches or pet damage. Consider your home theater and personal needs for what color and material works best for you. Being able to put your feet up is also a key part of a comfortable movie watching experience. If this is something that interests you, go for chaise lounger style footrests. These allow you to stretch out and put your feet up for optimal comfort. Power seats also allow the user to recline and put up footrests with just the touch of a button. However, do keep in mind that these options are often more expensive. If power seats are out of your budget, manual seats offer the same comfort at a lower price. Some models offer in-arm storage. This can be a great place to store remotes. Don’t overlook the details! There are many accessories available to help upgrade your home theater seating. Avid wine drinker? 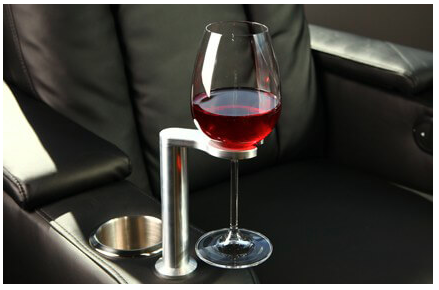 Add a wine glass caddy to your seat! An LED reading light also offers extra light to your armrest, so you’ll no longer need to interrupt your guest’s viewing pleasure by turning on the overhead lights. Seatcraft offers adjustable tablet holders as well. If you add loveseats or sofas to your home theater and later decide you want an extra armrest, loveseat side arms can be purchased too. And, remember – a home theater is not just about the seats and the screen. Spice it up by adding drapes to the screen’s sides for an authentic theater look. Everyone loves snacks! Concession stands can be a great way to keep drinks and snacks handy while adhering to a movie theater theme. Consider including a popcorn machine for a constant supply of freshly popped popcorn. Is popcorn not really your style? Add a bar cart to the room instead. For a fun touch, a customized marquee sign can be added to a wall if space permits. This is a great way to take the decorations in your home theater up a notch. Other decoration ideas include framed movie posters of your favorite films or wall sconces for some mellow lighting. If you’re ready to upgrade your home theater seating, our home theater experts are here to help! We can help you with any questions you may encounter, from material and style choices to arrangement options. This entry was posted in Home Theater and tagged design, home theater, seats on May 10, 2017 by seatcraft.